In order to use Read&Write with UCA accounts, you will need to install the Read&Write extension for Google Chrome. This is a two-step process: first, log in to Google Chrome, and second, install the extension. The Read&Write extension must be used with the Google Chrome browser. You must also have your UCA email account user connected to, or logged into, Google Chrome. Before installing Read&Write, you must ensure that you are logged in to the Chrome browser using your UCA email account. This extension will only work for users with email addresses that end with @uca.edu or @cub.uca.edu. For help with this process, follow the steps above. Open Google Chrome and click the Customize and control button ( ). Roll the mouse cursor over More tools, and then click Extensions. Scroll to the bottom of the Extensions page, and then click Get more extensions. This will open the Chrome Web Store. Enter Read&Write for Google in the search field, and then press Enter on the keyboard. This search will return the results for Read&Write for Google Chrome and Screenshot reader. You will need to install these two extensions. Next to Read&Write for Google Chrome, click the blue Add to Chrome button. Click Add extension at the prompt. Once the extension has been added, a message will appear stating that the extension has been added successfully. This message will close automatically when you click anywhere within Chrome. Next to Screenshot reader, click the blue Add to Chrome button. Click Add extension at the prompt. Once the extension has been added, a message will appear stating that the extension has been added successfully. This message will close automatically when you click anywhere within Chrome. 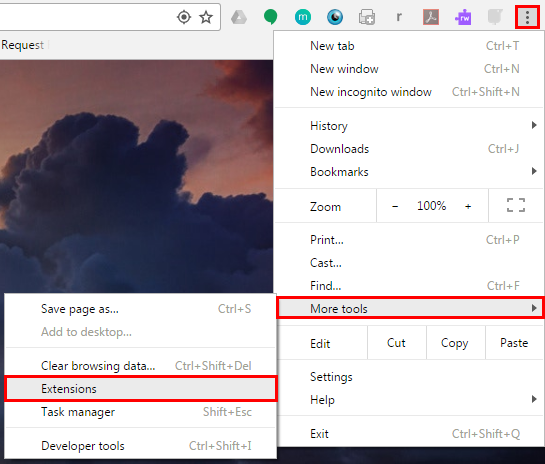 Go back to the Extensions page (this should still be open in another tab in Chrome). You should see the two new extensions listed now. Close Google Chrome, and then wait a few seconds. Then, open Google Chrome again. Now that the extensions are installed, you must allow them to interact with UCA’s Google G Suite applications. Start by clicking on the Read&Write extension icon ( ) at the top of the browser window. If this is the first time you have used Read&Write with your UCA account, you will be prompted to allow the extension to access your account. Click the Allow button. If required, click the Read&Write icon ( ) at the top of the browser window again. This will open the Read&Write toolbar. Read&Write for Google Chrome can also be used to access items in our Google Drive. 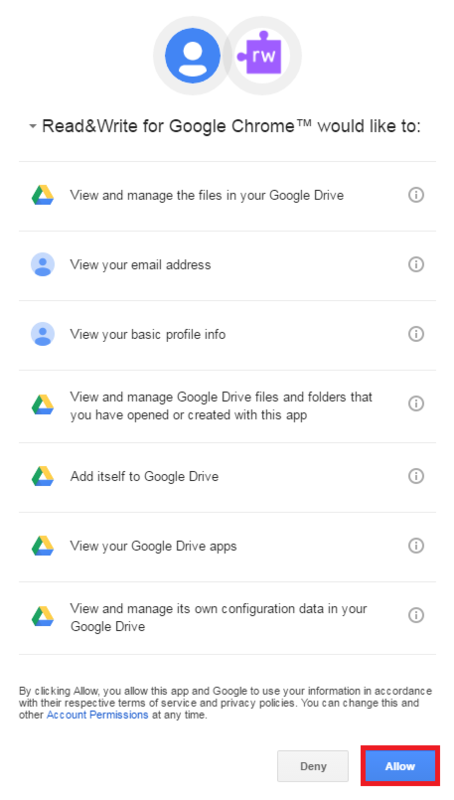 When you first access a Google Drive file, Google Doc, Google Slide, or a saved PDF document, you will need to allow Read&Write to access those items as well.